Overview: This activity invites students to explore interesting aspects of Japanese culture and a few Japanese traditions. Preparation: Ensure that your students have access to this website or print out copies of the following 4 artworks included here: First Visit to The Year to the Shrine, Tanabata Festival, Boy’s Festival, and The Game of “Kendo”. 4. Allow 5 minutes per group (20 minutes in all for 4 groups) to display their assigned art piece, present their discoveries and insights and lead a short discussion. 5. End with a brief discussion of what the students have learned about Japan and the importance of tradition in Japanese culture. 6. Suggested additional activity, if time allows: Re-enactment: group members form a “tableau” with each member selecting one person in the scene. Copy their body position, facial expression, etc. and freeze. At the signal, each participant unfreezes and all group members interact and act out in action and dialogue what might happen next. 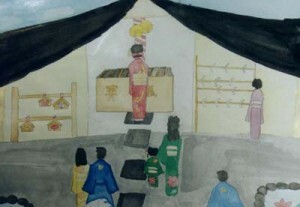 a) Visiting a shrine on _______________ is one of the typical Japanese customs. b) What do they give to the shrine? c) What are they wearing? a) Temples in Japan strike ___________ times on the eve of the New Year. Why? b) Why is the New Year’s holiday so important to the Japanese? c) What do the visitors do at the shrine on New Year’s Day? a) Is there a special place where you can make your wish in your culture? b) What is your wish? c) Why are traditional days/holidays so important to different cultures? Re-Enactment: (Time permitting)Create a frozen picture (or tableau) by each of you taking the posture of one of the people in the scene. Try and imagine what your character might be feeling and thinking. Once frozen, at the count of 3, unfreeze and carry out what might happen next by moving and speaking. End the scene after about a minute. a) What’s on the tags that are hanging from the tree? b) When is the “Tanabata” festival? c) What do they do with the tree after the festival? Why do they do that? 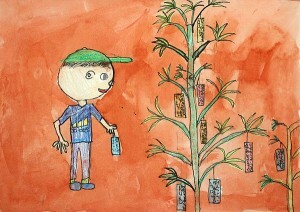 a) “Tanabata Festival” is originally from ____________. b) What is the legend of Tanabata? c) Which main characters are there in the “Tanabata” story? a) Does this festival remind you of any festivals or traditions you celebrate in your culture? b) What other cultures use smoke to send a message to their deities? a) When is the Boy’s Festival? 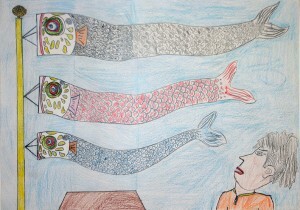 b) What kind of fish do you see in the picture? c) What do the Japanese celebrate on the day? How do they do it? a) What is the Japanese wording for “Children’s Day”? b) A carp is a symbol of ______________________________________. c) Do children use this day to thank and show respect for their teachers, parents, and relatives? a) Do you have a similar symbol to represent health and/or strength in your culture or country? b) Do you think every culture should have a “Children’s Day” festival? a) Kendo is the art of____________? b) It is derived from sword fighting techniques practiced by ____________warriors 1000 years ago. 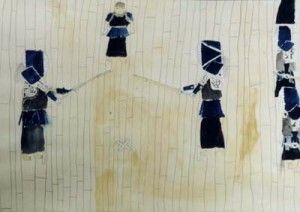 c) What is required to play Kendo well? a) Instead of a metal sward, in Kendo, ________________ is used. b) What does this sport remind you of? c) How important is speed and timing in this sport? a) How important is competition in your culture? b) Should Kendo be one of the Olympic Games?